The magnificent rosemary planting in the center of the Madalene Hill Herb Garden at The Arbor Gate always attracts the attention of visitors to the garden. 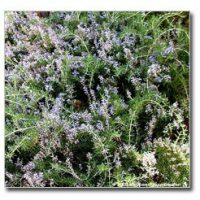 Most are amazed to learn that it consists of only three Prostrate Rosemary plants, which are now about three years old. 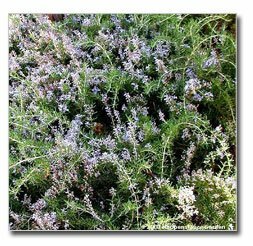 Although the upright rosemary cultivars are recommended for their flavor, the prostrate varieties produce great drama in the garden. Far from prostrate in the literal sense, these rosemary plants do, in fact, trail from a strong and massive center. During spring and early summer, their vivid blue blooms attract bees and butterflies to the garden. Well-draining soil, day-long sun, judicious watering, and very gentle pruning of the trailing stems will keep these magnificent specimens in order for many years.